Free Shipping Included! ProSource ps-1113-m-chin-up 300 lb Capacity Heavy Duty Wall Mount Chin Up/Pull Up Bar, Black by ProSource at Strongman Pictures. MPN: ps-1113-m-chin-up. Hurry! Limited time offer. Offer valid only while supplies last. 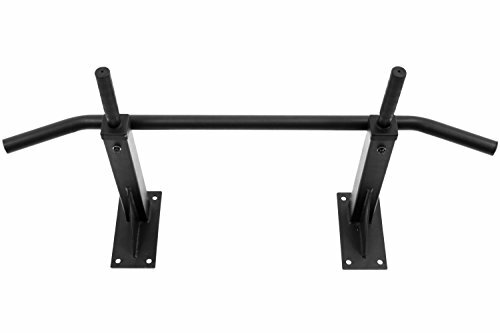 The heavy duty wall mount chin-up Pull-Up bar from ProSource provides an inexpensive way to tone and build muscles at home, without large equipment. The heavy duty wall mount chin-up Pull-Up bar from ProSource provides an inexpensive way to tone and build muscles at home, without large equipment. Can be installed on Cement wall or wooden wall and it comes with hardware for both Cement and wood surfaces. Thanks to the gym's multi-position design, you will be able to develop your back, chest, shoulders, arms, and abdominal compound muscles with one simple piece of equipment. In addition to traditional pull-ups and chin-ups, the bar allows you to perform closed-wide angle and hammer grips. Constructed out of high-grade steel. The Bar's maximum weight capacity is 300 pounds.